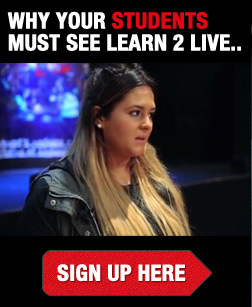 What is Learn2Live and does it work? Learn2Live is a true partnership; with representatives from Local Authority Road Safety Teams, Fire & Rescue Service, Police, Paramedics, Family Liaison Officers, Consultants as well as family speakers. Since the first event took place on 12th March 2008 at the International Riviera Centre in Torquay, over 100,000 students and service personnel have seen L2L across Devon and Cornwall and have learnt how ‘…a moment’s madness really can lead to a lifetime of sadness’. You've seen a thousand crashes in films and on the TV and often characters in the story walk away with little more than a few scratches. The dreadful truth is that when it happens for real, someone important to your story - your life, might not walk away - they might never walk again; they might not come out of it alive. And when that crash happens, the impact stretches far and wide, there are numerous agencies that are involved when it all goes wrong. L2L targets young people as they are statistically one of the most at risk groups when it comes to road traffic collisions. We enable young people to understand specific risks and consider the consequences of their actions. We encourage them to make small changes to their behaviours and develop appropriate coping strategies (e.g. SAFE PLANS) that can use to make sensible safe choices with regard to their safety when travelling on the roads. Last year, Young drivers represented 22% of car driver casualties despite only representing 6% of Devon's car license holders. Young drivers are often involved in collisions where they have failed ot cope with unexpected situations due to their inexperience. 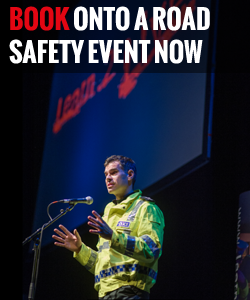 The Learn2Live presentation has been developed in line with the latest academic research and road safety education guidance. Learn2Live have used a recent publication by the RAC Foundation ('Using Behaviour Change Techniques: Guidance for the Road Safety Community' written by Dr Fiona Fylan) to inform the design of our Learn2Live event format and support materials. The presentation iitself is based on a short film, depicting the scene of a group of friends going out for a night, having a collision, the emergency services arrive, one of the friends is taken to hospital, where she dies from her injuries. Finally the family are informed by the Police Family Liaison Officer and true impact of a single collision is revealed. As the different emergency services arrive, the film is paused and a member of that emergency service comes out on stage to tell of a collision they have attended. The stories they tell are real and told from their own personal point of view. The final speakers are all (extra) ordinary people, who have had a member of their family killed or seriously injured in a collision. They speak of the collision and also of the effect it has had on them and their family. The very last speaker is someone who has either been the offending driver or a passenger within a road traffic collision. Each speaker explains factors that led to the cause of the collision and describes coping strategies that students can use to reduce their risk of being involved in a similar situation. Students are encouraged to formulate personal SAFE PLANS to keep themselves and their friends safe. The reason why L2L is so impactful is because students witness and understand the true impact of a single road traffic collision and the effect it has on all of those involved. We call this the ‘Ripple Effect’ – which is like throwing a pebble into a pond – the ripples extend far and wide. Real people - Our speakers are remarkable individuals who relay their highly emotional and personal stories. They volunteer to do this so that you and your families do not have to suffer in the same way that they have. Yes! Learn2LIve is continually being evaluated as the presentation is developed in line with the latest academic research. To date research by the University of Exeter and Plymouth University have concluded that Learn2Live is helping to positively change the attitudes of young people towards driving. In 2014, Learn2Live was evaluated by Dr Lauren Weston from Plymouth University as part of her Psychology PhD. The results of her study have shown that Learn2Live has a positive effect on students attitudes and behaviours to road safety. You can read more about her research here. Learn2Live has also been evaluated by Dr Cris Burgess, University of Exeter and shown to be an effective road safety intervention. To read the full report please click here. Learn2Live is again being evaluated in 2017 by a PhD Psychology student from Plymouth University. The results of this study will investigate the effectiveness of Learn2Live and also the Learn2Live Question Time (follow up) sessions in changing attitudes towards road safety . We will publish the results when they are available.